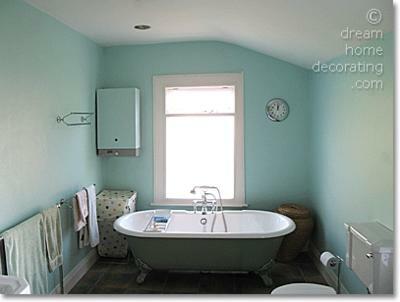 Our family bathroom used to be painted a chalky turquoise color. It looked good and felt good, as long as it was a sunny day outside. On a cloudy morning, the room made you want to crawl back into bed. We agreed that "something" had to happen. For a while, we considered a completely new color, but we couldn't find one we all fancied. Bright yellow? Too in-your-face. Pale yellow? Too whimpish. Dove grey? Pale and uninteresting. Pink? No thanks, we're English. Terracotta? Too claustrophobic. In the end, we settled on a lighter version of the old turquoise/earthy browns color scheme. The new wall color is actually a mint. It's a little greener than the original turquoise, and it really brightens up the room. It looks good with our old wicker furniture as well, and there are speckles of the mint color in the floor tiles. I hope you don't mind the smallness of this before-and-after! I decided to submit anyway because the difference the lighter color made surprised us all! Renate's Reply: Thank you, Stella, what a great example of how you can change the atmosphere of a whole room with just a fresh lick of paint! Your "new" bathroom looks great! This bathroom in my old house makes me feel so nostalgic. It had so much character and it feels so warm and comforting! where is the after ???? The new look makes the room look calm, clean and relaxing. The colours really work well. 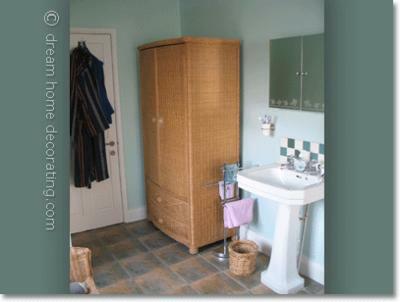 I love the rattan cupboard and the tiles. They do give warmth to the place. 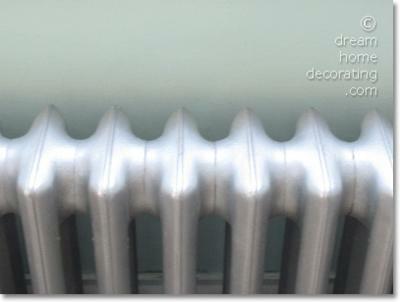 I'm quite smitten with your radiator color. What a cool idea. Love it. Nice bathroom color scheme, Stella! I like that it's almost complementary (orange/bluey green). It really works. 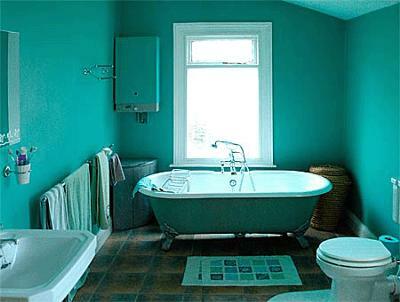 I was looking for color ideas for my own bathroom, and yours is really nice. Thanks for showing it round!